In lupus (systemic lupus erythematosus), the immune system – which is designed to fight external threats – produces antibodies that attack the body’s own tissues, causing inflammation. It has a range of symptoms that often overlap with other conditions, which can delay diagnosis. However, earlier detection and treatment can help to limit the damage. Lupus affects about 15,000 people in the UK, and more than five times as many women as men, often during our childbearing years. Women of Afro-Caribbean and Asian origin are also more at risk. The cause isn’t known, but may be related to faulty genes (it’s more common in people who have a family history of lupus), hormonal changes (menopause, pregnancy or puberty), environmental triggers (viruses, smoking, ultraviolet light/sunshine) or medicines, including chlorpromazine (a tranquilliser) and some heart or blood-pressure treatments. Fatigue is probably the most common symptom and can be severe. However, fatigue could be caused by many other conditions. Your muscles and joints may ache, and feel very stiff after rest or sleep. Tendons and other soft tissues may be damaged, too. You may also notice fever, headaches, chest pains, swollen glands, mouth ulcers, skin rashes or a ‘butterfly’ red rash over your nose and cheeks, often made worse by sunlight. Lupus is one of the many causes of Raynaud’s phenomenon, which makes fingers and toes go suddenly blue, white and cold, especially in cold weather. Internally, lupus can cause damage to the kidneys, heart, blood, lungs and nervous system and, at worst, can lead to kidney failure, anaemia, clots, strokes, epilepsy, psychiatric problems or pregnancy complications, such as miscarriage or toxaemia. For some people, though, lupus symptoms are only mild or intermittent, and the treatment for more severe cases continues to improve. 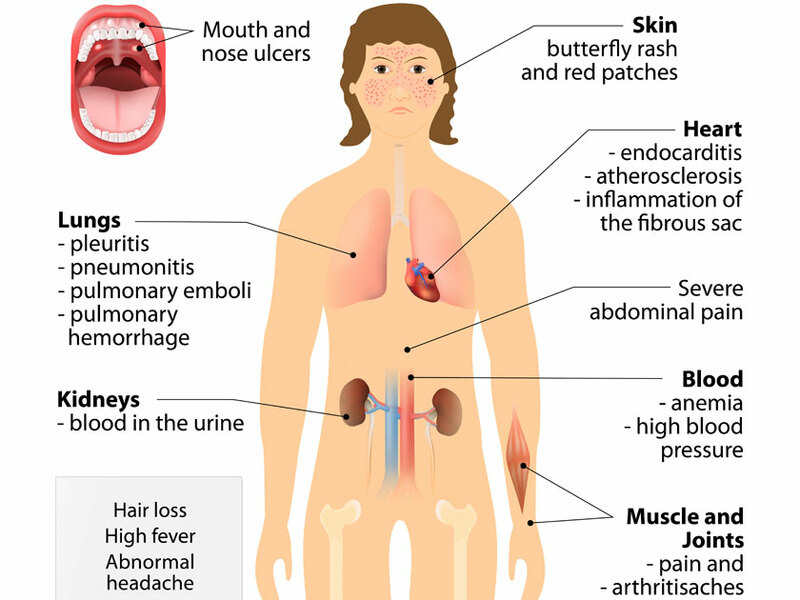 People who have lupus are also more prone to drug allergies and severe infection, as well as conditions such as an inflamed thyroid, diabetes, raised cholesterol or blood-pressure levels, osteoporosis, certain cancers, hardening of the arteries and other autoimmune disorders, such as rheumatoid arthritis. Painkillers and anti-inflammatory drugs, such as ibuprofen, can relieve symptoms. Reducing sun exposure, eating a healthy diet, exercising, not smoking and dental checks are important for general health, too. It’s also worth contacting Lupus UK for information and support. Call 01708 731 251 or visit lupusuk.org.uk. Disease-modifying immunosuppressive drugs, such as hydroxychloroquine, cyclosporin and azathioprine, or ‘biologicals’, such as belimumab, can significantly help to reduce inflammation and damage, although they all require careful monitoring (through blood and urine tests). Steroids and other powerful immunosuppressives may be used for brain or other complications. Occasionally, dialysis or plasma exchange (removing antibodies from the blood) may be needed. You’ll probably be cared for by several different specialists, depending on your symptoms, and if you’re planning a pregnancy, tell them beforehand. Recurrent miscarriage (often caused by tiny blood clots) can be treated with blood-thinning heparin injections and aspirin, but you’ll need careful monitoring throughout your pregnancy. 1. Blood tests for antibodies linked to lupus. These may appear before symptoms, but may not all be present. The ANA test may also be positive in other conditions. 2. Blood tests for anaemia, kidney function, signs of inflammation and to rule out other possible causes, such as fibromyalgia, diabetes, thyroid or liver disease. 3. Urine tests for blood and protein to check for signs of kidney damage. 4. ECG (heart tracing), chest X-rays and MRI/CT scans if heart, lung or other organ damage (or other diagnoses) is suspected. 5. Regular blood pressure and cholesterol checks.